The fresh report published in the Transparency Market Research report demonstrates fragmented structure owing to large and small players in the local and international platform. The growing prevalence of life style disease and infectious disease and increase in healthcare incidence is one of the key factors stimulating growth of this market in coming years. The growing adoption of novel technologies to treat the disease are some of the factor propelling growth of this market. The increase in healthcare expenditure and growing adoption of new technologies to treat the disease are some of the key factors boosting growth of this market in the near future. The numbers of key vendors functioning in the global medical waste management market are BioMedical Waste Solutions, GRP & Associates, Inc., LLC., Republic Services, Inc., Sharps Compliance, Inc., and GRP & Associates, Inc. The manufacturers are highly focused toward strategic mergers and acquisitions to launch new product in order to expand their geographical outreach. The revenue generated by the global medical waste management market is likely to touch valuation of over 10 Bn in 2016. This market is likely to expand at the 5% CAGR during the course of forecast period from 2017 to 2025. On the basis of service type, the off-site global medical management market is likely to lead the global medical waste management market owing to lucrative deal provided by the leading service providers. Geographically, North America is likely to lead the global medical waste management market due to strict government policy for the medical waste management market. The growing awareness among the population regarding the bio-hazards and increase in early spending can be one of the important driver for the growth of the global market. However, other regions such as Europe is expected to account for second largest region for the growth of the global medical waste management market. The increase in lifestyle disease such as high blood pressure, cancer, and diabetes can be one of the factors propelling growth of the global market in the near future. The increase in hazardous medical waste is one of the key factors stimulating growth of the global medical waste management market. This is due to increase in the geriatric population which requires surgical process and various treatments and increase in research and development activities in the biotechnology and pharmaceuticals sector is another trend driving growth of this market over the forecast period. 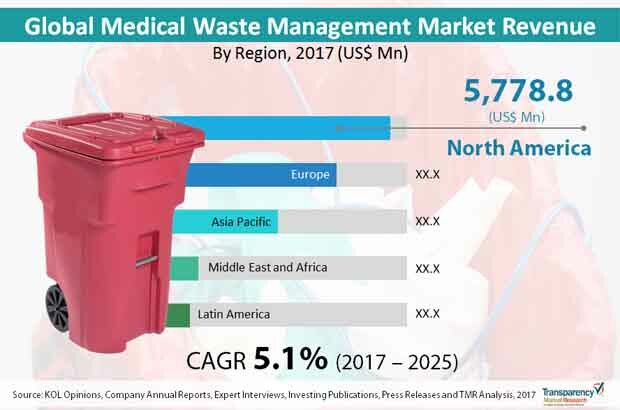 The growth of this market also depends on the number of procedure performed by the medical institution, ambulatory surgical center and retail pharmacy can be another important factors supporting growth of the global medical waste management market in the coming years. On the other hand, As per report published in the WHO, Around 85% of the medical waste are non-hazardous in the nature, Conversely, the medical waste cannot be allowed to dispose it on the municipal landfills without taking prior permission or without proper treatment as there is still a chance of contamination by mixing the non-hazardous with the hazardous waste at the location where waste is treated.